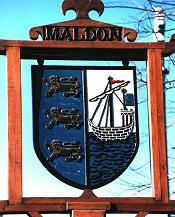 The Battle of Maldon (991AD) took place on the shores of the River Blackwater in Essex. 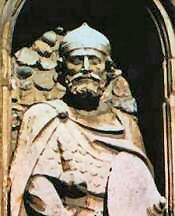 There was a heroic stand by the Anglo-Saxons against the Viking invasion which ended in utter defeat for Brithnoth and his men. The battle's progress is related in a famous Anglo-Saxon poem, only part of which survives. This site also contains a commentary, a translation of the poem, a map, and images of the battle-ground as it is today. There are also currently about thirty links to other relevant international sites to assist researchers to find further information. Note the addition of material on Brithnoth's tomb at Ely, the JRR Tolkien connection, and the statue of Brithnoth erected in 2006 in Maldon. We have also added the outline of a new theory of the actual location of the battle site - see Intro page. This website has had a much-needed major revamp which hopefully will make it work better on tablets and phones. If you find things that don't work properly, do email me! I have purged a number of non-working links, and have added some fresh links as well. ©HJJB 1997-2017 Please use material freely for personal or educational purposes, with acknowledgements. For all other uses, please click to email for permission.